Venezuela's Foreign Minister Delcy Rodriguez has criticised as "rude meddling" a joint communique by 11 Latin American countries calling on Venezuela's government to "guarantee the right to peaceful protest". The 11 countries also condemned the death of six people in anti-government marches this month. The opposition is planning a mass protest for Wednesday. Venezuela is deeply divided between those who support the government of the socialist President Nicolas Maduro and those who blame him for the country's economic crisis and want him gone from power. 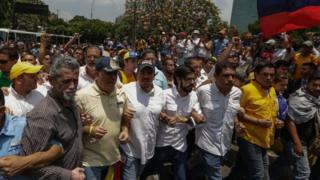 They called on President Maduro "to prevent any violence against protesters" and also called on opposition groups "to exercise their right to demonstrate responsibly so that the day remains peaceful with people expressing themselves calmly". Foreign Minister Delcy Rodriguez labelled the communique as "rude interference". She also wrote that "these governments misuse international law to back interventionism in Venezuela to attempt to govern the country from abroad". She ended a series of tweets by saying that "there is no imperialist force in this world which can defeat the sovereign people of Venezuela".